Had some ideas to prototype motions faster. 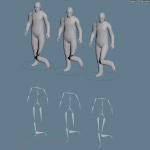 These first ones have to deal with the animator having access to a library of parametric functions or preset animation curves which are fit between two key points. 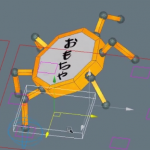 This would allow the animator to quickly cycle through many graphs without having to commit with the workload of building the in-between keys and manage the their handles. This is specially helpful at breakdown and splining stages when one is looking for the correct timing and feeling in the transitions. 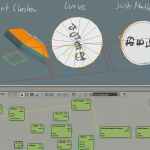 Top) Parametric curves with exposed parameters, allowing to roam through a library of easings that would be to time consuming to shape by hand, editing the control handles and adding more control points. http://easings.net is a good reference. Middle) Approximation of the parametric curves into bezier curves. 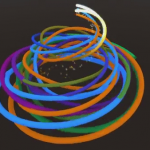 So if the animator is happy with the parametric approach he bake them into beziers and manage them as usual. 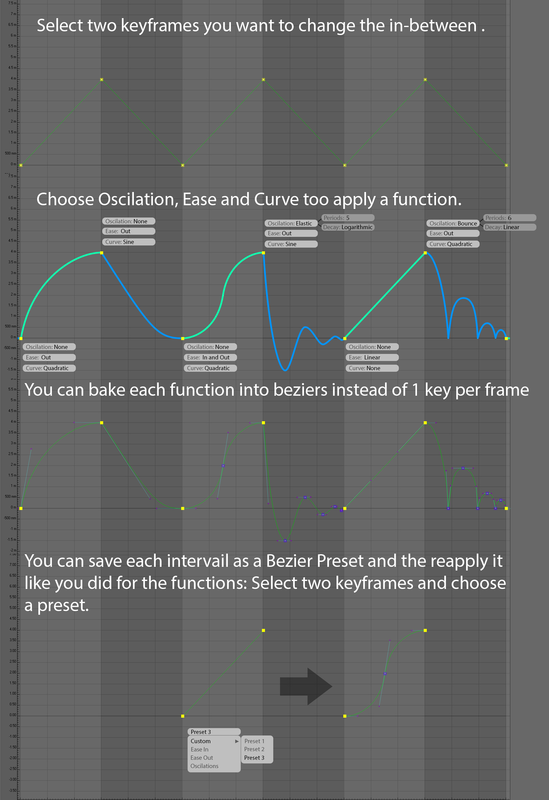 Bottom) Curve presets. Saves all the control points and handles of an interval in a normalized format. The presets can be re-applied by selecting two key points. This will erase any in-between contents and fit the preset between the two key points. 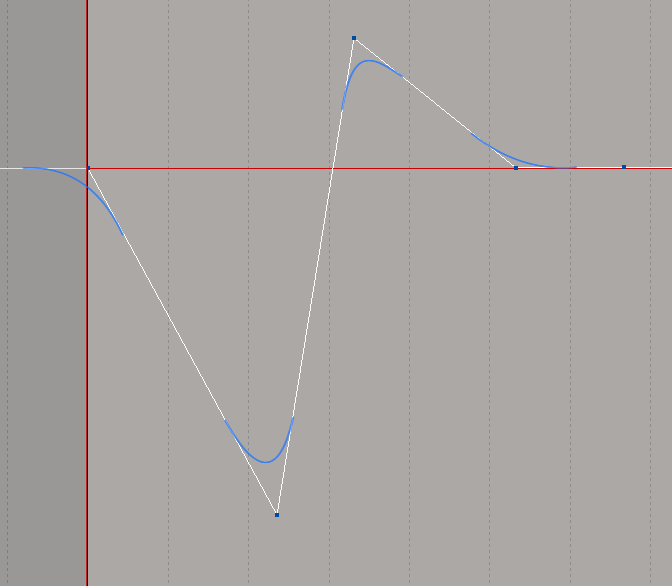 The advantage against parametric modulation is that allows to store and call very customized curves the animator likes. Linear curves with Fillet. Key points with no continuity require to be split into 2 keys or add one before and after in order to preserve the slope but locally smooth the transition at the key. With this solution, there’s no need to add more keys since there’s a parametric fillet at the key point with a certain radius. The result is similar to what happens when we subdivided meshes with Catmull-Clark, where the smoothed mesh does not pass through the control points, but it’s approximated. 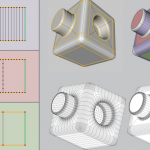 Both parametric features, function fitting and fillet, have the advantage of respecting the motto “Smooth results, coarse control”, since as one changes the key points the result updates. 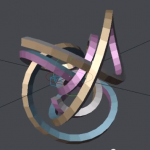 So unlike the bezier presets there is no need to manage the in-between data since the fitting is interactive.